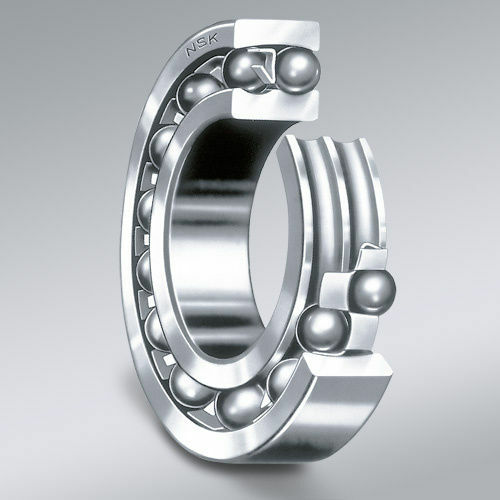 Ball bearing / spherical / steel / high-speed - NSK Europe Ltd.
NSK self-aligning ball bearings have been designed to overcome the problems of shaft and housing. The inner ring of this bearing has two raceways and the outer ring has a single spherical raceway with its center of curvature coinciding with the bearing axis. Therefore, the axis of the inner ring, balls and cage can deflect around the bearing center to a certain extent. The angular contact of balls is small and offers lower axial load capacity. The allowed dynamic misalignment under the condition of normal load is approximately 4˚ to 7˚. Bearing is made of ultra high-quality steel that imparts robustness and increases the life by up to 80%.